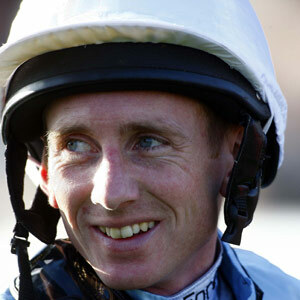 Britain’s Champion Jockey in 2010 after an epic duel with Richard Hughes (Hughes was 22 winners behind at one stage but cut that to one with three days left; the final winning margin was two winners) and again in 2011, after a similarly epic battle with Silvestre De Sousa, whom he beat by just four winners. The third northern jockey in 105 years to win the championship. Rode 1,102 races during the 2010 season with 191 winners and 1,133 races in 2011 with 165 winners, with trainer Richard Fahey providing him with most of his ammunition. He was also crowned Champion Apprentice in 2002. His first Group 1 win came on Wootton Bassett in the Group 1 Prix Jean-Luc Lagardere at Longchamp in France in 2010. From 2012 he has had a new retainer as first jockey to owner Sheikh Hamdan Al Maktoum following the retirement of Richard Hills. Hanagan continued to ride for Richard Fahey when available and the duo teamed up for their domestic Group 1 success with Mayson in the 2012 Darley July Cup at Newmarket, a key race in the Sprint division of the QIPCO British Champions Series. In 2013 he rode Aljamaaheer into a place in both the JLT Lockinge Stakes (third) and the Queen Anne (second), while he was just collared on Mukhadram in the Prince of Wales’s Stakes. He then finished a slightly unlucky third (should have been second but for being hampered) on the same horse in the Coral-Eclipse. He got his first QIPCO British Champions Series victory of the year in the Nayef Joel Stakes when bringing home Soft Falling Rain in impressive fashion. 2014 started brilliantly for him when he partnered Taghrooda to a runaway victory in the Investec Oaks, claiming his first Classic victory. Next he took the Coral-Eclipse on board Mukhadram, making up for his unlucky third place in the race a year ago, and the QIPCO King George on Taghrooda marking a breakthrough season for him in terms of Group 1 victories. He lost out on Taghrooda in the Darley Yorkshire Oaks, however, finishing second to Tapestry. 2015’s Champions Series began with Hanagan watching Muhaarar win the Commonwealth Cup at Royal Ascot after passing over the three-year-old to ride another of Sheikh Hamdan Al Maktoum’s horses in the race, but he didn’t make the same mistake when the Darley July Cup came around; Hanagan made the right choice to partner the exciting colt to a last-gasp win on the July Course at Newmarket. Hanagan’s success with the star sprinter didn’t end there as he went on to win the Prix Maurice de Gheest at Deauville before landing his fourth Group 1 on the bounce in the QIPCO British Champions Sprint Stakes on Champions Day in imperious fashion. His day wasn’t done there though as he produced Gabrial with a late surge to grab third spot in the Queen Elizabeth II Stakes.